After playing a low scoring game Saturday night at home in a win against Colby, the Seward County Saints played a barnburner Wednesday night in the Greenhouse against Dodge City, coming up on the losing end of a 105-92 decision as the visiting Conqs shot 65% in the second half and 60% overall on the night to hand the Saints their 10th loss of the 2016-2017 season. Despite the Conquistadors getting out to an early 8-4 lead, Seward hung with 2nd place Dodge most of the first half, coming back to tie the score at 10 four minutes in and taking a two point lead on a three from Micah Littlejohn at the 14:37 mark. After Dodge regained the lead near the midway point of the first, another Littlejohn three pushed Seward ahead and a triple from Kevin Sims put them up by five 28-23. 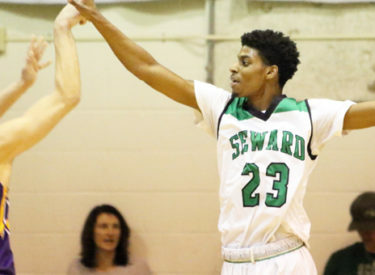 Seward took their largest lead of the night moments later as Deionta Nunnally connected on a pair of free throws to give the Saints a six point advantage, but back came the Conqs. Dodge erased the six point Seward cushion and took a one point lead of their own with 4:14 to go in the half and eventually outscored the Saints 19-5 down the stretch in the first to take a nine point lead into the locker room at 51-42. It was an offensive first half for both sides as the Saints shot 50% but were topped by a 56% mark from Dodge that included the Conqs nailing 6 of 12 from downtown. Sims and Littlejohn each scored 11 first half points for the Saints while Malik Brown had eight on 2 of 3 shooting. Dodge carried the momentum right over to the second half as they quickly turned a nine point advantage into 20 just four minutes in and didn’t stop there as an ice cold Seward team played on their heels with the Conqs putting up 29 points in the first 5:50 of the half to go in front by 28 after a three point play on their end. The Conqs put it on cruise control from there, keeping a 20+ point cushion for most of the second half until the final three minutes when Seward outscored Dodge 14-2 to make the final score respectable at 105-92 in favor of the visitors. It was a disappointing night for Seward who shot 48% overall and 45% from the three point line while getting to the free throw line 38 times and cashing in 76% of those tries. They just didn’t have an answer for the high powered Dodge City attack that shot 65% in the second half and 60% overall on the night. Littlejohn finished with a career high 23 in the losing cause while Sims scored 19 off the Seward bench and Brown chipped in a career best 16. Seward drops to 6-10 overall and 3-9 in their worst defensive showing in conference play since 2007 while Dodge continues their recent run as they quietly improve to 12-4 overall and 9-3 in conference action. The Saints will look to wrap up the first half of conference play with some success Saturday night when they travel to the Perryman Center in Garden City for a 7:50 tip against the rival Garden City Broncbusters.